Friendship is as friendship does, and immigrants to a new land gotta stick together. When your crazy friend asks you to carry half a couch clear across town, you have to help him. At least you get to call him crazy all day long. Manuel and Dado (Jeffrey Quizon and Bayani Agbayani) are Filipinos working in Taiwan as bicycle assemblers (they made my bike!). Manuel gets it in his head that he needs a couch for their rooftop, some bad Taiwanese beer (at least it will be cold), the stars shining down from above, and then life will be grand. But the couch is key. He finds the perfect couch, outside a new apartment building. He and Dado watched a couple fight over the couch, then leave it on the sidewalk in a huff. If only Manuel could get it home, he’d be set. From that point on, Pinoy Sunday becomes a road movie as the two men push, pull, and drag the couch ever toward, never quite reaching, home. 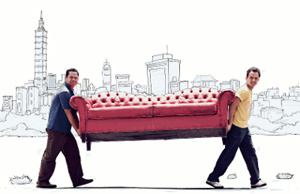 Two foreigners — one fat one thin — moving a couch has lots of opportunities for humor. In fact, I suspect Laurel and Hardy did something very like this. Manuel and Dado carry the couch through traffic. They ride it on the back of a tuk-tuk, they push it on a shopping cart. They even reach a point where they have to cross a river with it. Clever as it is, Pinoy Sunday is overwritten and overacted. The movie stops in its tracks to make sure you got the latest joke: “You mean to tell me? That you broke up with your girlfriend? On her birthday? Which you had forgotten?” Yes, that’s what he just said, and we got it the first time. The camaraderie is enjoyable and bright. That they are good-natured immigrants in a foreign land give them a rooting interest as underdogs. But unless you have a specific interest in Filipino/Taiwanese films, you can probably skip Pinoy Sunday.